15 years in research, development and applications for this proven innovation. This ultra-light footing, using 4″ PVC Sc 40 (220 psi) with a 10″ base, has been tested to hold up to 27,000 pounds! 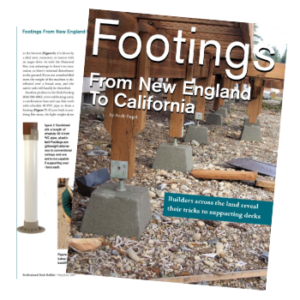 Redi-Footing has unbelievable strength and is practically indestructible. Dig the hole, place the footing in the hole, back fill the hole. Redi-Footing is the perfect footing! And don’t just take my word for it. 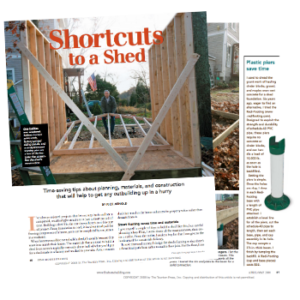 See what they have to say in Fine Home Building, Deck Builder Magazine, on Bob Villa’s site…and many others. You don’t need a wheel barrow. You don’t need a mortar tub. Once you assemble your Redi-Footing (takes about 3 minutes) there’s nothing else you need but a shovel!